The fingerprint tech is expected to make its debut on the 2019 Santa Fe SUV, with a 'Dynamic Update' feature for maximum security. 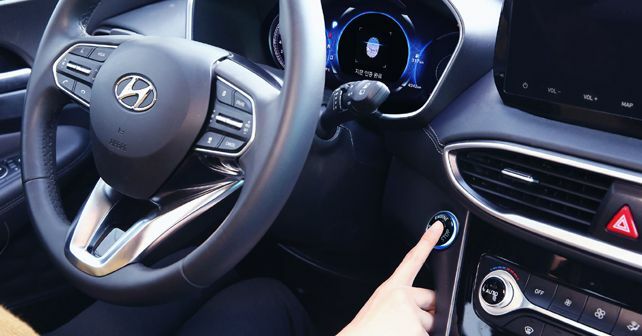 Hyundai Motor Company has revealed the world’s first smart fingerprint technology which allows a driver to start a car and unlock its doors without the use of the key. Hyundai claims that the technology will make its debut on the 2019 Santa Fe, in the first quarter of the year. However, owing to vehicle rules and regulations, it will be available only in select markets, globally. 'In the future, Hyundai Motor plans to further expand the application of the technology to allow the adjustment of temperature, steering wheel position, and many other features which will be tailored to driver’s preferences,' said Albert Biermann, President and Head of Research & Development Division of the Hyundai Motor Company. 'This will ultimately offer quality driving experience to each and every Hyundai customer,' he added. Besides providing a custom driving environment, the smart fingerprint tech also claims to be five times more safe and effective than conventional vehicle keys, including smart keys. With the help of 'capacitance recognition', which detects differentials in the electricity level in various parts of the fingertip, the technology eliminates misuse through forged/fake fingerprints. Hyundai claims that their technology has only a one in 50,000 chance of misrecognizing a person's fingerprint, and with the help of a 'dynamic update' system, the fingerprint system can continually improve its success rate through real-time learning. This technology will slowly be made available on more Hyundai models over the coming years, with availability expanding to more global markets.